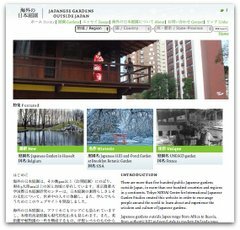 Shibaura House asked 10 foreigners living in Kanto to design half day and one day tours, primarily for Japanese to re-discover their country with a new perspective. 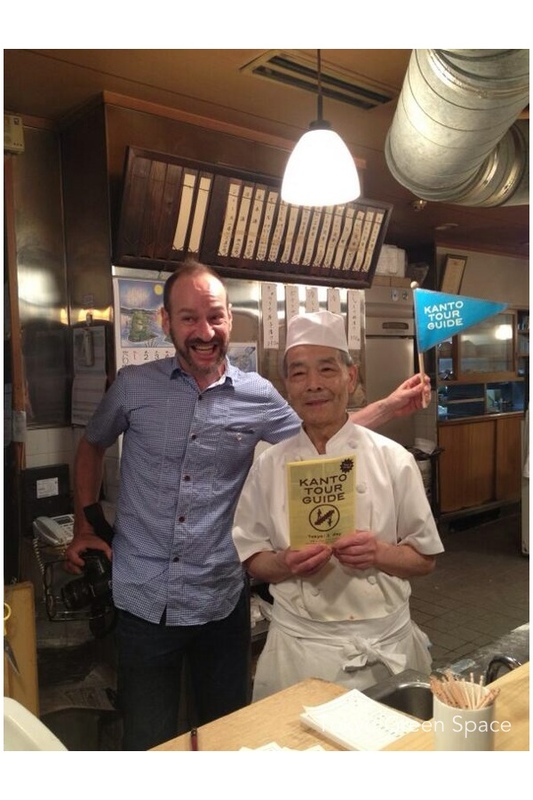 I wrote a short guide for Suginami, starting with my favorite Higashi Koenji tonkatsu restaurant named Tonki. Shibaura House even made a small tour group flag. I think the chef was surprised by our visit. Afterwards, we visited Amp Coffee, cookie shop Steka & Mojl, Kuge Crafts (手仕事屋久家), and the Suginami Childrens’ Traffic Park near Zenpukuji river. There’s some great photos on Shibaura House’s Facebook page. Also here. More information about all 10 tours on their website. 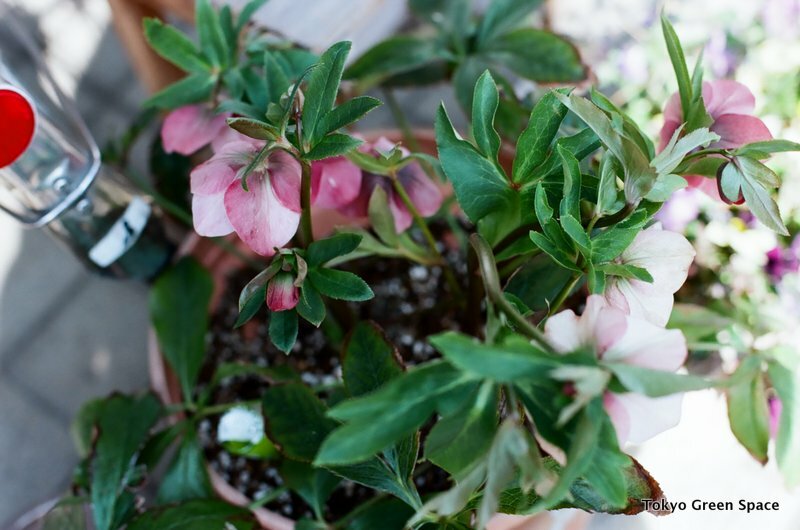 This potted hellebore, pronounced kurisumasu rouzu in Japanese, looks super lush outside my favorite tonkatsu restaurant, Tonki in Higashi Koenji. These flowers signal the end of winter. In the park next to Higashi Koenji. The kilometers of mature gingkos lining Omeikaido make this wide and busy boulevard much more enjoyable. The yellow leaves are now, of course, all gone. 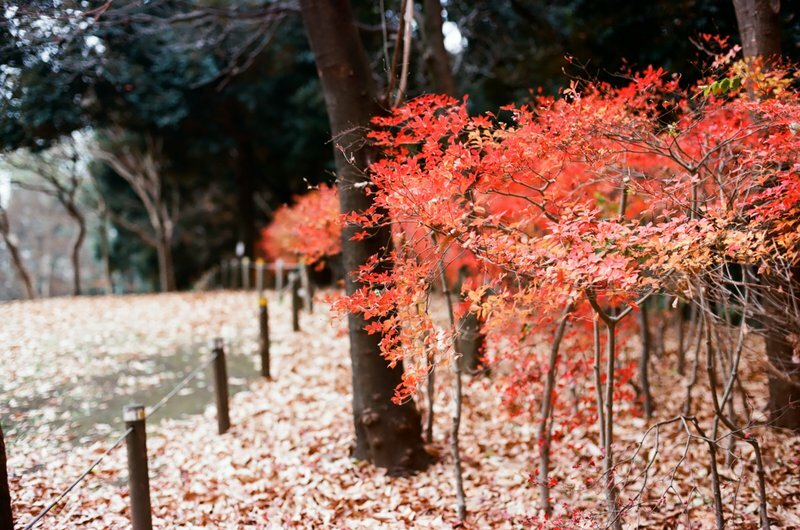 But since I am posting more film photographs, I want to share some of my favorite fall photos that were recently developed. 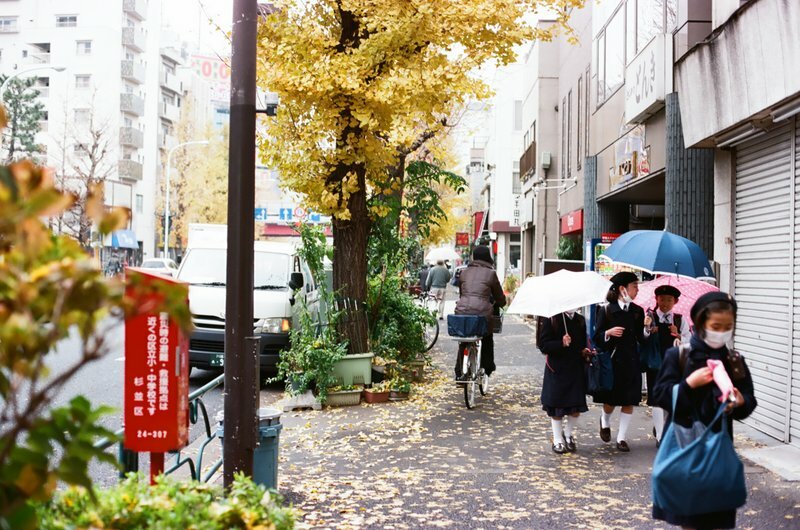 Fallen gingko leaves, school uniforms, umbrellas, face masks, and a slow-moving sidewalk bike are a perfect urban scene. Azaleas bring back memories of the East Coast in the US, particularly the mid-Atlantic region where I grew up. August has more foliage than flowers, and it seems that few can bear the unrelenting heat. That’s what’s so wonderful about “Mukuge” (ムクゲ) a Japanese hibiscus that grows easily on Tokyo city sidewalks. I like the wild colors that make the city more spectacular, and Mukuge forms part of the Aoi (アオイ）family of flowers associated with the Edo shogunate. Photo of Omeikaido Dori sidewalk, across from Sanshinomori Park in Higashi Koenji 蚕糸の森 公園、東高円寺。A small sign says that it was planted in March, 2010 with support from KDDI. I am always amazed at how fast and tall hydrangea grow in Tokyo. The ample rain and warm weather makes them shoot up out of nowhere. I like how this huge cluster on a Tokyo boulevard effectively hides the ugly utility box. This space between the sidewalk and wide street is usually planted with ginkos and azaleas by the local government. Like the hollyhocks down the street, these hydrangea were probably planted by a neighbor and then reappear each year on their own. When I walk through Tokyo, I realize that the beauty of spring flowers, and plants in general, are increased by their juxtaposition with the built environment. There’s something about the context that makes urban nature more beautiful and more captivating. Above are lilacs blooming on May 1 in Tokyo on Yasukuni Dori in Shinjuku, across the street from Isetan’s rainbow circular parking lot. Below are dogwood in full bloom in Higashi Koenji, with a 15 story apartment building behind the tree. And at a different scale, there is the constant contrast between my potted balcony plants and the city that extends in every direction for as far as the eye can see.